The Networking Panel is an application to manage network connections from STUX Live: it is designed to configure networks and restore network status on startup: if configuration is saved persistently, network configuration will be preserved on reboot and connections are re-established, if requested. Double-Click with mouse on a line to perform the selected operation. Here are the connections configured. Right-Click with mouse to access functions to perform over selected connection (connect, disconnect, edit, delete). This is the connections status. You cannot interact with this section: this section only shows all active connections. To assign an host name, open the Network Panel, double click on 'Host name' in the ' Select operation' section. Select your hostname and click Ok to set. To configure a new connection, open the Network Panel, double click on 'New connection'. Click Next to skip the introduction. Select the connection type you are going to configure, and press 'Ok'. Choose a name for this connection. Insert username and password as provided by your ISP. Choose the device where dialup modem is attached and its speed. WARNING: if the checkbox 'Always On' is checked, and the configuration is saved, STUX will try to reconnect automatically on reboot. The name for ethernet connections is choosed automatically, that is eth0, eth1, eth2, etc. If you don't want to use the ethernet card, check the 'Card not configured' option. To activate ethernet card, check the 'Always On' option. 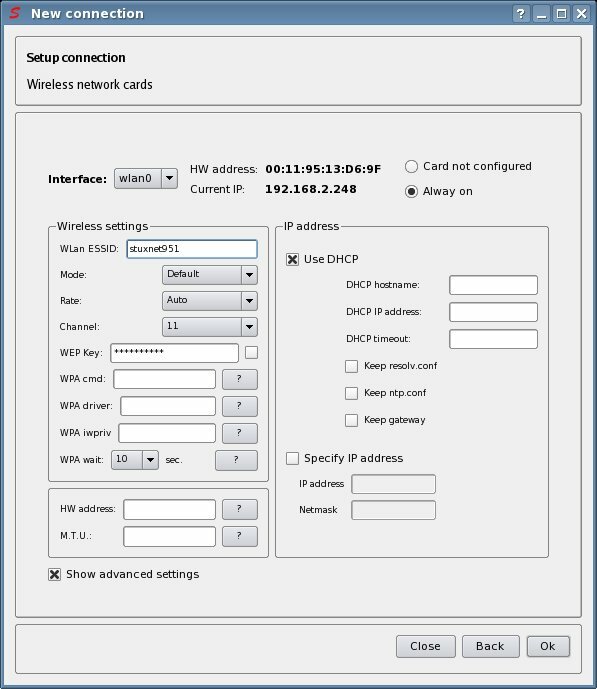 Use DHCP to configure the card. if required, specify the DHCP hostname provided by your ISP. Specify an IP address and netmask. choose an IP address and a netmask. Unexperienced users should use netmask=255.255.255.0. NOTE: If configuration is saved persistently, ethernet connections are automatically reconfigured at startup. If required, insert username and password for the connection. Be sure that ADSL modem is correctly connected to an ethernet card. Click button 'Search modem': this will search an ADSL modem on available network interfaces. 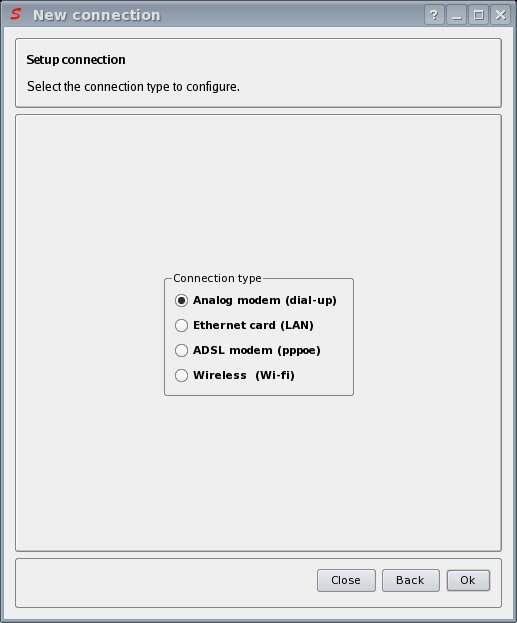 If no modem is found, check if ADSL modem is powered and is correctly connected to an ethernet card. You cannot continue until ADSL modem is correctly detected by this procedure. NOTE: ADSL connections are automatically reconnected at startup until the checkbox labeled 'Restart at boot' (that is visible when the checkbox labeled 'Show advanced') is checked. When modem has been successfully detected by the 'Search modem' procedure, press 'Ok' to start connecting. You can track connection status in the Status textarea (see picture). STUX supports several wireless cards and all cards are theorically supported via the NDisWrapper module that allows to use Windows™ XP drivers. NDisWrapper is not recomended (but sometimes there is no alternative) and sometimes loading an XP driver into memory could freeze system. Here you can see the list of wlan interfaces and you can add new wlan interfaces loading the right module (driver). 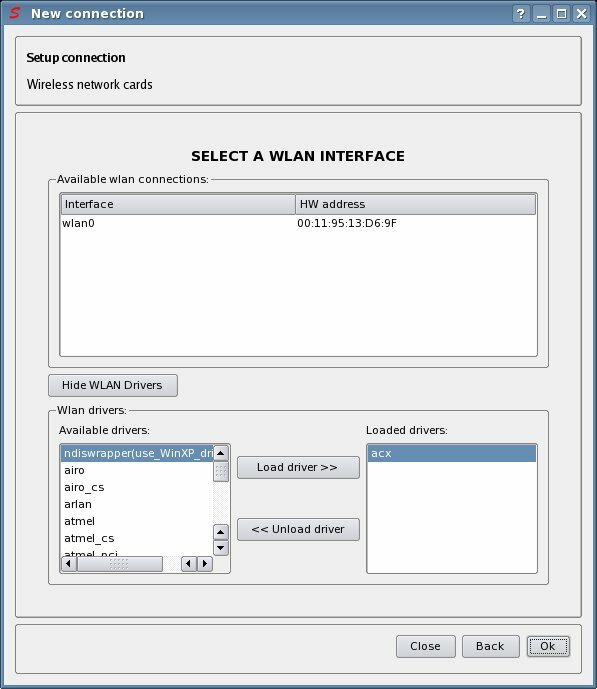 Once the driver is correctly loaded, the new interface should appear in the list of available wlan interfaces; to configure the free wlan interface, select it in the list and press the button 'Ok'. 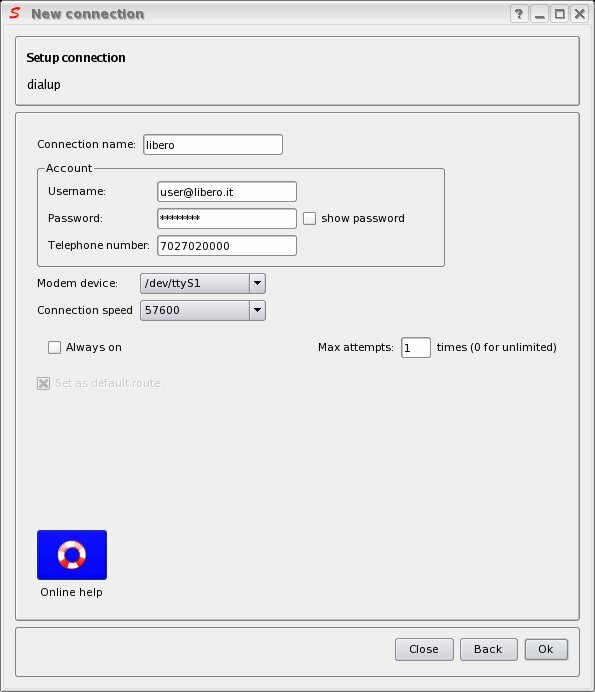 Insert the ESSID of the network where you wish to connect, or leave it empty to select 'any' network. NDisWrapper does not support 'any' option, so, if you use NDisWrapper, you need to specify the correct ESSID. Choose the driver that matches your card. If not available, use NDisWrapper. If you selected NDisWrapper, you will be prompted for the location of the Windows™ XP .INF file: you can use the CDROM shipped with the wireless card to locate the Windows™ XP .INF file. 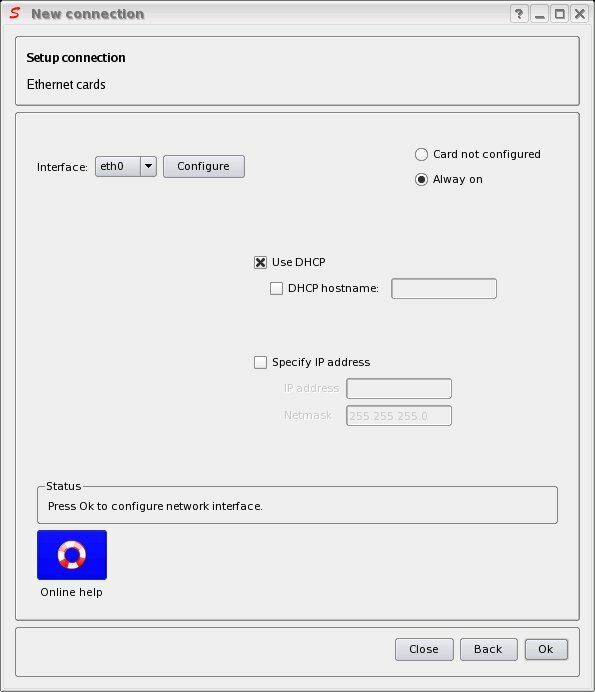 If IP address is provided by DHCP server, check the radio button labeled 'use DHCP'. You you want your own IP address, netmask and gateway, check the radio button labeled 'Specify IP address', insert IP and netmask. Wireless panic hint: if the wireless card stops to associate to the Access Point, unloading and reloading the module could help to restore a wireless connection. For internet connections, usually you don't need to configure the DNS to resolve IP addresses because this is normally done by your ISP, depending on connection type. If you need to edit the servers that resolve IP addresses (DNS), double-click on 'Domain Name Servers' in the Network Panel. At least one Domain Name Server is required to resolve IP addresses. 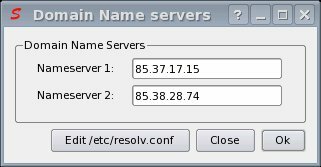 For advanced DNS configurations, it's possible to edit directy file /etc/resolv.conf clicking button labeled 'edit /etc/resolv.conf'. If you have multiple network connections, you need to specify which of them is the default, and optionally a default gateway. For internet connections, at least one default route is required. 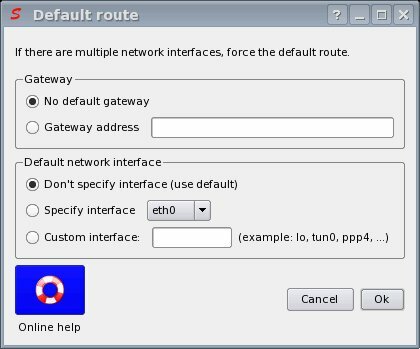 If you need to specify the default route, double-click on 'Default gateway' in the Network Panel. This program sets the current default route and/or gateway and, if configuration is saved persistently, will set boot scripts to re-set default route on startup. Select the default network interface and/or default gateway and press 'Ok' when ready. If you have multiple network connections, and at least one of them is an internet connection, you probably want to share the internet connection with other network connections. You can do this with IP masquerading (aka NAT - Network Address Translation -,aka Network Bridging). To configure IP masquerading, double-click on item labeled 'Network Address Translation' in the Network Panel. 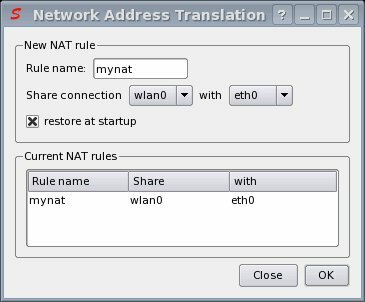 In the picture above, we can see a NAT rule configured to share TCP/Internet connection on interface wlan0 with interface eth0. You can add multiple NAT rules. To delete a NAT rule, right-click with mouse on the rule, and choose 'delete' from pop-up menu. choose interface connected to the network you want to share. choose interface that will be allowed to use the shared connection. If the checkbox labeled 'restore at startup' is checked, and if configuration is saved persistently, the new NAT rule will be applied on startup. 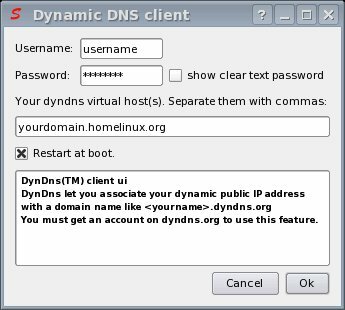 If you have a dynamic IP address ( tipically ADSL or dialup connections ) and you wish to dinamically associate your IP address to an host name ( like example.net or yourname.homelinux.net ), you can use services like www.DynDNS.com. To use this service you need to register, download and run a client software that will check at fixed time intervals if your IP address is changed, and, if changed, updates the DNS in order to make your PC always reachable using an unique domain name, even if you IP address changes. STUX supports DynDNS.com service including DynDNS client software in distribution. double-click on item labeled 'Dynamic DNS' in the Network Panel. Insert the username and password used to register to DynDNS service. Insert your static domain name. If the checkbox labeled 'Restore at startup' is checked, and if configuration is saved persistently, DynDNS client will be started when system starts up.